Well drilling is in our blood. 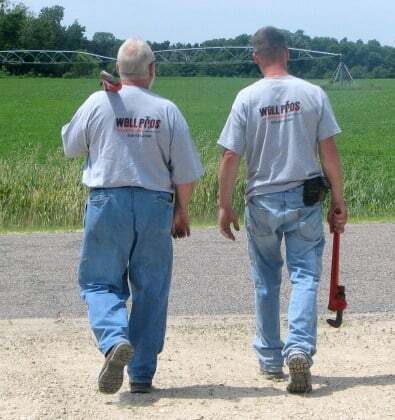 Mark Inglett and his father, Dave Vinson, have over 35 years of experience in the installation and service of water systems for residential home owners, farmers, businesses and small municipalities in Western Wisconsin. This means they have seen (and properly handled) almost every situation that may arise in the Well Drilling and Pump Installation and Service business. Mark Inglett also has many years of experience in operating all types of heavy machinery and working as a pipe layer with a large excavation company. Mark carries a Class A CDL license and Hazmat Card, along with a Pump Installation License and a Drill Rig Operators Card. Well Pros Pump & Well Drilling Services believes in providing a quality water supply to their customers through prompt, affordable, honest and courteous service. Our goal is not to be the largest business in our field, just the BEST. You will need a licensed well driller if you plan to build a new home that is not serviced by city water. This will also be necessary if you plan to use the ground as a resource for Geothermal Heating and Cooling. If a well becomes contaminated, a new well may need to be drilled. As a licensed pump installer, we can repair or replace a pump from the well to the pressure system. We can also perform water testing, chlorination of well, well and pressure system inspection, abandoning of a non-compliance well, water line leaks, pressure failure, and many other aspects of the well-to-pressure system. Well Pros is the only well drilling and pump service in the Greater La Crosse area accredited by the Better Business Bureau. Our clients are located in the greater La Crosse area, including La Crosse, Monroe, Jackson, Trempealeau, Vernon and Buffalo Counties. We are able to provide any and all services needed that are related to well and pump services.